AURORA ALERT: Did you sleep through the Northern Lights? Next time get a wake-up call: Spaceweather PHONE. COLLIDING SATELLITES: For the first time ever, two large satellites have collided in Earth orbit. 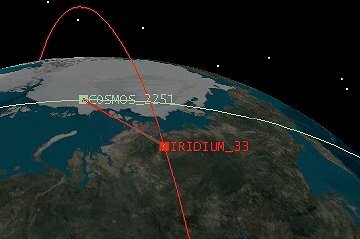 It happened on Tuesday, Feb. 10th, when Kosmos 2251 crashed into Iridium 33 approximately 800 km over northern Siberia. Both satellites were completely destroyed. U.S. Strategic Command is tracking hundreds of satellite fragments. In the 48+ hours since the collision, the debris swarm has spread around both orbits. Experts characterize the distribution as a pair of "clumpy rings"; one ring traces the orbit of Iridium 33, the other traces the orbit of Kosmos 2251. This injection of debris substantially increases the population of space junk at altitudes near 800 km. Collisions are now more likely than ever. Fortunately, the International Space Station orbits Earth at a much lower altitude, 350 km, so it is in no immediate danger. The Hubble Space Telescope is not so safe at 610 km. In the days ahead, researchers will carefully study the make-up and dynamics of the debris cloud to estimate when bits will begin to drift down to lower altitudes. LISTEN UP: The US Air Force Space Surveillance Radar is monitoring the skies above Texas for echoes from satellite fragments. Try listening on Saturday, Feb. 14th between 2:18 and 2:28 am CST (0818 - 0828 UT). That's when Kosmos 2251 would have passed over the radar intact had it not been shattered. The low latitude and magnetic polarity of this sunspot identify it as a member of old Solar Cycle 23. It is, in other words, a fossil, albeit a relatively active one. Stay tuned for more flares. On February 13, 2009 there were 1025 potentially hazardous asteroids.